If you're not familiar with the management of the domain name's host records, I'll strongly recommend taking help of a technically sound and trusted contact. It'll ensure that the normal functioning of your website is not affected in any way. Once the branding process is complete, do once check the new feed address in a modern web browser or in a feed reader application to test if it's pulling the content correctly or not. Let's start! For demonstration purpose, I'll use my personal blog's Feedburner feed. The very first step in the branding process is the configuration of a CNAME host record. The latter one uses the blog's custom domain name and looks much better than the default one. Step 1: Log in to your Feedburner account and click the 'My Account' link present on the top right part of the screen. Step 2: Thereafter, click the 'MyBrand' option. It'll open the service activation page with all the configuration instructions. To ensure that the process is finished smoothly, complete the steps in the same order as presented on this page. Step 3: Now is the time to add a CNAME host record to your domain name. The details of the record to be inserted are present on this page. Here, the CNAME record will use the following details. 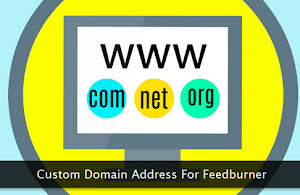 Host: A subdomain name of your choice. For example, I'm using, updates. TTL: You can use the default value of this field. You can note that I've blurred the first part (see above) of the record entry. It's unique for each account and one should use their own account's value. You may note that there's a dot symbol at the end of this entry. One must include it while adding the CNAME record. Here's the actual host record's screenshot I've added to my domain management dashboard. If you want to use some other subdomain name, feel free to do so. Just make sure it is not confusing and relates to the RSS feed of your blog. Now that you've added the CNAME record at the right place, it's time to move on to the next step. Step 4: Go back to the 'MyBrand' page within your Feedburner account and add the subdomain URL to be used within your branded feed address. You may note that I've not added the http prefix to the subdomain URL. Finally, click the 'Activate' button to start the branding service. You should give some time to DNS propagation before you can use the modified and branded feed address for your website subscribers. I'll recommend a wait of 24 hours. Step 5: Now that the primary branding steps are completed, it's time to ensure that the site's original feed is properly redirected to the new branded feed address. If your blog is running on Google's Blogger platform, complete the following step for proper redirection. Go to 'Settings → Other → Site feed → Post Feed Redirect URL' option and enter the branded feed address as shown in the image above. Do not forget to save the new settings. And, if your blog is running on self-hosted WordPress, use the following redirection directive within the .htaccess file. On both the platforms, no extra redirection steps are needed. Existing subscribers using the old Feedburner address will continue to receive the content without any disruption. And last but not the least, make sure you've updated all the feed subscription URLs on your site with the new branded feed address. I'll recommend that you too subscribe using the new feed address.